« Rhinoceros beetles and unwanted smallholder schemes: the problems facing villagers in Korindo’s North Maluku plantation. On 16th June 2017, a meeting was held between representatives of the six clans from Puragi village, the company, and local government officials to discuss the dispute. In that meeting the District Legislative Council agreed to act as mediators, but since then have shown little initiative. The company’s response was to start clearing the disputed forest. A written request dated 15th September by the Iwaro Customary Council and an organisation of Iwaro youth and students, asking that the company should stop clearing until the dispute has been resolved, has also not produced the intended result. ANJ, in its annual report, claims to support Free Prior Informed Consent, and describes an consultation event which took place in 2016 in Teminabuan, a town some 60 kilometres from the plantation, as having “reset ANJ’s relationship with stakeholders, especially indigenous landowners”, and “was a vital step in maintaining the integrity of our commitment to obtain Free Prior Informed Consent”. Elsewhere in the report ANJ says it sees FPIC as a “continuous process”. This is a obvious misrepresentation of the FPIC principle, which should be completed prior to any financial transactions for land or work commencing, and therefore before the situation becomes mired in conflict and vested interests. 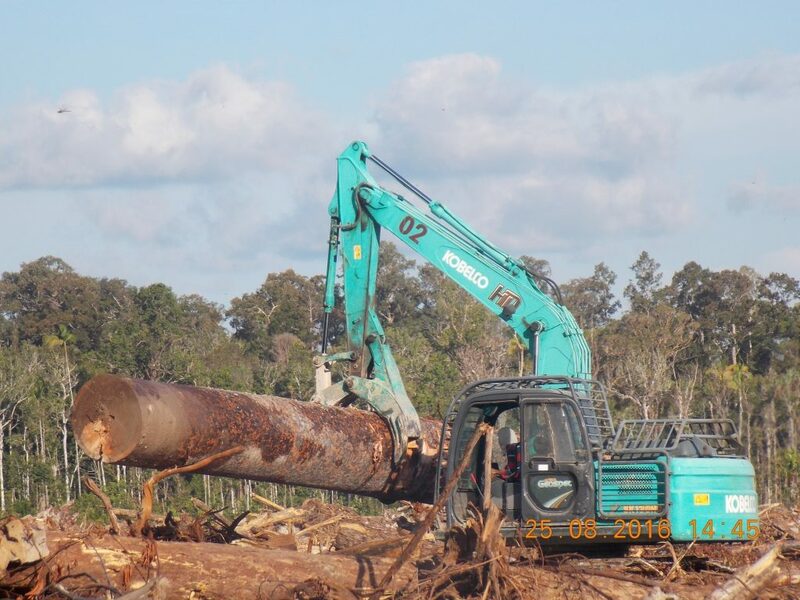 There is no evidence that ANJ engaged in a process of Free, Prior Informed Consent before starting land clearing. It did obtain signatures of indigenous people stating that they would release customary land to the company, between June and September 2013, just six months after ANJ took control of the two companies, but no description of the process used has been provided, neither in its summary social impact assessment, nor in the court papers. There is therefore no proof that all who hold land rights were in agreement, and that signatures were not obtained through coercion, manipulation or deception. Receipts from the company show that the Iwaro people in Puragi were given 100,000 Rupiah per hectare (US$7), and other ethnic groups were given between 50,000 and 130,000 Rupiah per hectare. It is inconceivable that in free and informed negotiations, anyone would accept such low rates, especially if we believe PT PPM’s 2014 social impact assessment which says people could make a monthly income of between 1.5 and 9 million Rupiah from sago and fishing before the plantation. Before starting again recently, ANJ had stopped cutting trees within its Papuan concessions pending the preparation of a comprehensive development plan with new assessments of areas of high conservation value.1 This was a response to pressure from the palm oil industry, as the company had lost most of its major customers for failing to commit to stopping deforestation. Those assessments are apparently complete, and the company has set aside 40,000 hectares out of its total 91,000 hectares in Papua for conservation. However, it has not sent the new management plan to any of the stakeholders which have criticised the company in the past, and has failed to respond to requests from awasMIFEE to see a copy. A sustainability policy was published in November 2016. However, this policy is weaker than that of most of its peers in one key area: it does not contain a no deforestation pledge. It only says that ANJ will not clear primary forest, but felling secondary forest is OK as long as it promotes rural development in line with the nation’s development goals. This position will not satisfy the majority of palm oil traders with commitments to not buy from companies which deforest, leaving the company dependent on the few buyers who haven’t made sustainability commitments. This is a big risk for the company, but ANJ appears to have decided that its Papua concessions, which comprise 51% of its landbank, were too valuable to give up on. However, even on primary forest the company has not much to be proud of. In its 2016 Annual Report, refuting previous criticism from Greenpeace, ANJ states that it has “never knowingly cleared primary forest”. Actually, land-cover data, published annually by the Indonesian government, shows an area classified as primary forest (dark green) in PT Putera Manunggal Perkasa’s concession in 2014, which by 2015 had become barren ground (purple squares) as it was cleared in preparation for planting oil palm. ANJ’s previous HCV assessment submitted to the RSPO had classified the area as secondary forest, but this is not reliable, since the company has also admitted that some land in its original assessment was classed as secondary forest when it was actually primary forest. There’s no way to go back in time and find out what the land was before it became oil palm. Company statements on peat could also be clearer. ANJ says in its sustainability policy that it will not develop on peat or wetlands, and makes explicit that after its new High Conservation Value assessment, all wetland areas in its Papuan oil palm concessions will now be set aside for conservation. This will presumably include much of the swamps in the eastern part of PT PPM’s concession, which ANJ had previously categorised as hemist and saprist soils. These are types of partially decomposed organic matter which are types of histosols – often called peat, although actually peat does not have a rigid scientific definition. The big contradiction, however, is that just to the south of its oil palm concessions, ANJ has a 40,000 hectare concession to harvest sago palms. This development is on deep peatland, and ANJ has constructed a network of canals to transport the sago logs, which risks draining the swamp. Even though sago is obtained by felling large palm trees, it is classed as a non-timber forest product, meaning that a permit can be issued locally and safeguards are much less than for oil palm. Both when it comes to indigenous rights and deforestation, ANJ’s actions on the ground fall far short of the commitments described in its annual report and sustainability policy. Transparency is important, but if the only information the company can offer is commitments it doesn’t uphold and misleading statements, this is not transparency, it is greenwash. In your 2016 annual report, you stated that a new management plan was being produced and would be circulated to stakeholders when completed, although as far as I am aware, neither local groups nor international organisations that have criticised ANJ in the past have received a copy. Has this plan been finished? If there is a revised management plan and new HCV/HCS assessments, would it not be appropriate describe the new clearance as a new planting and resubmit a public notification on the RSPO website under the New Planting Programme to meet RSPO P&C 1.2? Especially since ANJ has stated that the original HCV assessment failed to identify an area of primary forest. This land is of particular concern, because there is an unresolved land dispute on the land in question, between PT PPM and the Gue clan and other clans which own customary land in Puragi village. In 2015, Yakomina Gue brought a court case against the company, in which the judge ruled there was no case to answer, but on a technical point, saying that the Gue clan should have included other parties in their complaint. Because of this the substance of the dispute was not adequately resolved through that court case. Local sources have told me that a meeting took place on 16th June 2017 in Sorong, which company representatives attended, with the outcome that the Sorong Selatan District Legislative Council agreed to act as intermediaries, however the dispute is still not settled. ANJ has also acknowledged the dispute in its recent Sustainability Report. 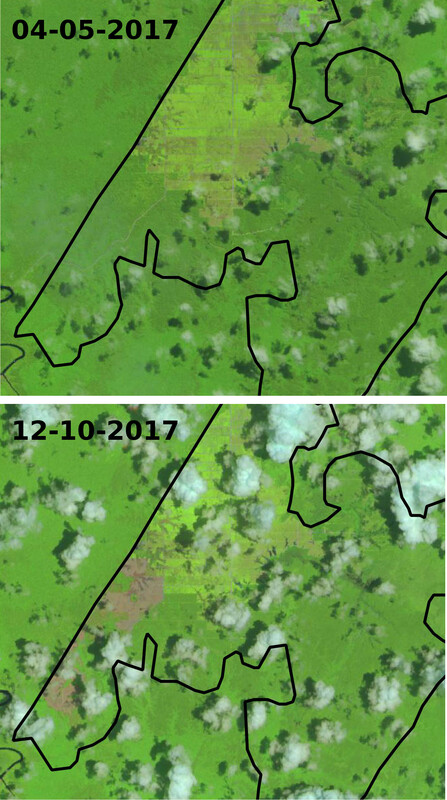 How is continued clearing on disputed land consistent with ANJ’s stated commitment to FPIC? Should the dispute not be resolved first? In ANJ’s Annual Report, it claims that Greenpeace was inaccurate to state that primary forest had been cleared. However, Indonesian land cover survey data available through the ministry website classifies land in PT PMP’s concession as primary forest in 2014, but as barren ground in 2015. a comparison, compiled from the KLHK’s interactive map service is attached. The classifications you mention in the report (areal penggunaan lain and hutan lindung) are zoning classifications in Indonesia’s forest estate and do not refer to the state of forest cover. On what basis does ANJ wish to claim that this land was not primary forest? The basis for claiming that PT PPM was planning to plant on peat was ANJ’s own map included in the HCV summary published as part of the NPP, which shows plans for cultivation on hemist and saprist soils, which are varieties of histosols, which are usually classified as peat, although admittedly peat is a colloquial term with no rigid scientific definition. Will these areas, which are extensively found in the eastern part of PT PPM’s concession, now be excluded from development? In your sustainability policy, you state there will be ‘no development on peat and wetlands’. However your sago concession is on peat land, and has involved the construction of canals to transport the sago logs. How does this fit with your policy? (http://www.rspo.org/news-and-events/announcements/free-prior-and-informed-consent-guide-for-rspo-members-2015-endorsed ). Does ANJ currently consider that the process PT PPM and PMP engaged in prior to the signing of land release settlements between July and September 2013 met these criteria? Why were the payments for land so low at that time, between 50,000 and 130,000 Rupiah per hectare? If ANJ agrees that the process for indigenous land acquisition did not meet the standard for FPIC in 2013, what steps are being taken now to address the land disputes that have arisen since that time, including the dispute involving the Iwaro people from Puragi village? A graphic on p133 of the Annual Report with the title ‘Public Consultation’ shows a picture of a policeman and soldier, amongst other stakeholders. Is the company aware that, especially in areas with a history of conflict such as Papua, the presence of police and military in negotiations is highly unlikely to be compatible with FPIC, as their presence alone is perceived as intimidating? Are Brimob guards still working with the company, and if so, how can the company justify this in the Papuan context? This entry was posted in Around West Papua and tagged ANJ Agri, Austindo Nusantara Jaya, Deforestation, Land Grabbing, peat, PT ANJ Agri Papua, PT Permata Putera Mandiri, PT Putera Manunggal Perkasa. Bookmark the permalink. Comments are closed, but you can leave a trackback: Trackback URL.